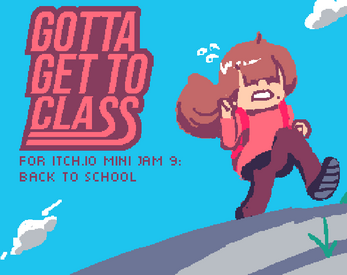 Our entry for the Mini-Jam-9 Back To School Game Jam of August 24 - 26th. The limitation was "two button controls" and there are just two controls - W for and S for down. Now duck, dodge and weave your way through distracted cell phone users, crazed Bird riders and more as you face the eternal struggle of the race to get to class. Keep running but remember to eat before your hunger meter runs out! Get there faster and with more points with more and more coffee! But the smart runners know the real points are in all the candy and potato chips one finds laying about campus.